Kim Knight is a writer for NZME’s Canvas and Weekend magazines. My dinner is on fire and I am not sure what to do. Rendered pork fat is dripping on to glowing charcoal, igniting flames that render more pork fat. It is a vicious-delicious cycle. But what if the flames get sucked up the extractor fan? What if they spark into the wiring? 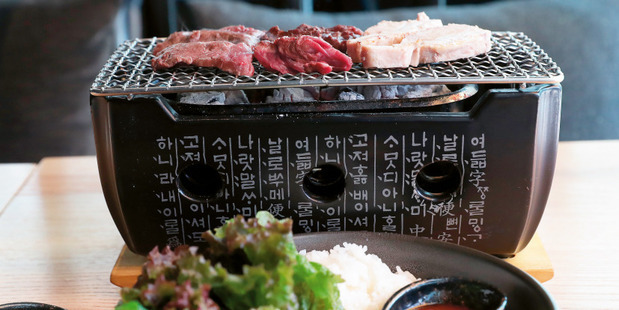 What if we all go down in a blaze of authentic Korean barbecue? "Don't worry," says the waitperson. "This is completely normal." He has been like this all evening. Quietly, reassuringly, brilliant. According to a recent Herald report, Korean food retailers and some mainstream supermarkets have experienced up to 300 per cent increases in the sale of Korean food products in the past two years. Accordingly, I'm contemplating my second contemporary Korean dinner in as many weeks. 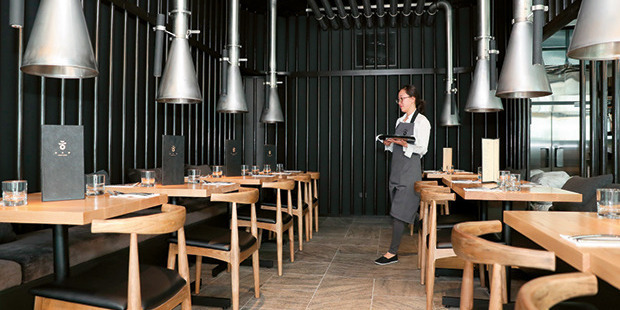 Han, newly opened in Parnell, is helmed by Min Baek (ex Merediths and Uni-Ko food truck) who describes his ethos as "experimental" and "creative". So that's powdered leek on the fried chicken ($6). The street-food staple that is usually a jumble of rice cake sticks and gochujang sauce is presented as a small and elegant row ($5). So far, so tasty, but then my mind is blown. I had approached Han a little nervously. The fit-out is all dark wood and chic steampunk, thanks to those extractor fans. The music is fine-dining plinky and there are $30-plus price tags on the predominantly meaty mains. When presented with a toaster-sized burner packed with dragonfruit charcoal, I feared humiliation by cultural naivety. Sausages on a stick on the beach? Absolutely. Perfect slabs of venison, free-range pork belly and beef skirt steak ($37) that I would cook myself at an intimate and sophisticated new Parnell eatery? Help. Enter that lovely waitperson. We were encouraged to grill till scorched to really get that charcoal flavour going. The pork was pre-cooked sous vide style, so all we had to do was caramelise it. The beef was chewy tasty, the venison super-lean. A bowl of rice, a multiplicity of chilli sauces and a pile of fresh lettuce and perilla leaves completed the dish (the latter, sometimes called sesame, have a distinct, astringent licorice-like flavour). Cook, wrap, eat. I got food everywhere, but the flavour was extraordinary. Meanwhile, James was juggling beef galbi ($34). An intensely caramelised beetroot, asparagus and syrupy gochujang oil arrive ready to go, but you must barbecue the meat (marinated, sweet and smoky) yourself. DIY-fine dining and an exercise in delayed gratification — the longer I stared at that perfectly plated beetroot, the more delicious it became. Rice cake sticks aside, there was just one vegetarian dish (a mushroom and cauliflower bibimbap) and only two desserts. A sculptural fruit salad made a mundane kiwifruit look amazing and it came with the most intelligent use of freeze-dried mandarin I've encountered, but it also cost $19. More interesting value was an $18 dish that combined beetroot, chocolate, a cereal-spiked anglaise, almond and red ginseng. The medical root is an infamous aphrodisiac (though the waitperson put it more delicately than that). At Han, you should finish as you mean to go on. Sizzling!